A flatbed scanner is usually not suitable to scan books. 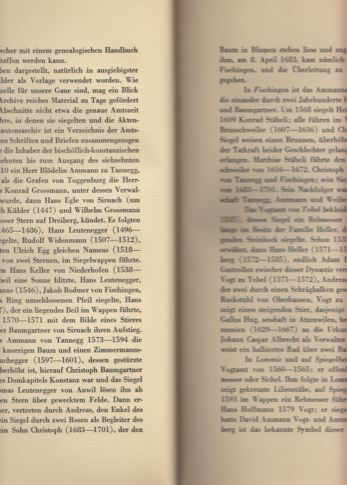 The result of the scan is not perfect since the book cannot be scanned without producing shadows on the border of the pages. In addition old and valuable books might be damaged when pressing them down on a flatbed scanner. After several tests with a flatbed scanner I came to the conclusion, that best quality can be reached by opening the book with an angle of 90 degrees only. The idea was to build a kind of a mounting plate which allows me to place the book with an opening angle of 90 degrees. The page is then photographed with a normal camera, mounted on a tripod. A good illumination is key for a good quality picture and that is why I installed just over the mounting plate two LED spots lightening the open page of the book. With this simple device, every book can be scanned carefully, quickly and with good scanning quality. The device requires little material and is easy to make. In my case I re-used old chip boards from a former IKEA cabinet. When doing the photos, it is important to place the camera in the centre of the page and to see that the picture is not distorted and that the border of the book remains in parallel with the border of the photo. Once all settings are in place, page by page can be photographed and turned over easily and quickly. Finally the taken photos require a post-editing session on a picture program. This can be time consuning but it will pay off with a proper copy of the scanned pages.